We have launched a second online campaign to raise fund for the Gaza Children Cinema 2018-2019. We are grateful for your invaluable contribution which allowed our to reach out to hundreds of kids in besieged Gaza through organized over 100 film screening. We are very determined to raise enough fund to keep the momentum of initiative as the summary school holiday is about the start in Palestine. Nearly half of the Gaza Strip’s 2 million people are below the age of 14. These are children who have been shaped by war; fear of another war; their family’s daily struggle to put food on the table; a lack of clean water, electricity and other basic requirements of living; and a future that is at once both monotonously unchanging and fraught with uncertainty. These stresses not only impact the children directly, but also indirectly through parents and siblings. Too often, depression, anger and anxiety are projected onto others in the form of verbal, physical or sexual abuse. Bullying has become a common way to respond to tension, while others withdraw deep within. Complicating this all is a culture that rejects any perception of weakness. Gaza children need a safe place to express themselves and explore alternative ways to process the world. 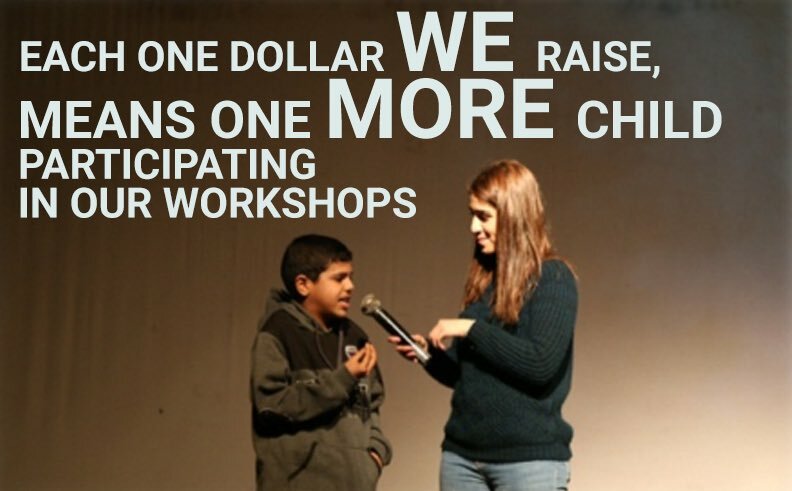 We want to use cinema and facilitated discussions as the vehicle, but we need your help. In 2013, several of us encountered Ahmed, just 10 years old at the time, working long hours selling ice cream on one of Gaza’s beaches. Uncharacteristically, we tried to engage him in conversation, to learn why he had to work so hard at such a young age. The encounter with the young Ahmed was in Gaza beach was an opportunity for him to have an informal space to express himself and voice out the hard social and economic realities of Gaza. As a result of that meeting, we started to imagine and explore how those children would have the awareness and conscious if they were raised up in a friendlier non-judgemental environment. The idea of mobile cinema came about that time in spring 2013. Film attracts with its entertainment, builds rapport with its characters and educates with its storylines. When carefully chosen, a movie, cartoon or short film relaxes children; allows them to escape from their home life; models desired values and behavior; and offers a safe, nonjudgmental way to process and comment on the themes that unfold. When shown in a group setting with facilitated discussion, it builds healthy engagement and constructive relationships with others. However, cinemas do not exist in Gaza and television—with its prime-time-ratings oriented content—offers the only such entertainment. 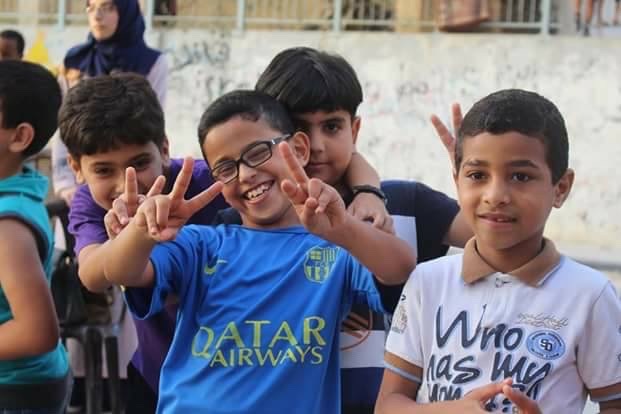 Gaza Children’s Cinema seeks to fill that gap with facilitated cinema gatherings at convenient community locations across the Gaza Strip, attended by vulnerable children in elementary and middle school and led by trained high-school-aged peers. 1. Introduce children to quality cinema that entertains at the same time that it facilitates exploration of diverse family and social issues. 2. Provide children from vulnerable families, especially those living in poverty or in areas most frequently targeted by Israeli incursions, with a safe and non-judgmental space for discussion, reflection and creative expression. 4. Promote healthy, positive conflict resolution through dialogue and tolerance. 5. Model nonviolent behavior during interpersonal conflicts as effective and “cool” (rather than “weak,” as is often the case in the Gaza environment). 6. Offer children with disabilities the same opportunities for entertaining, educational group activities as others, integrating them with their peers. We are partnering with select nonprofits in underserved areas of the Gaza Strip, such as Family Development Association in Beit Hanoun (to the far north, by the Israeli border) and in Rafah (in the far south, by Egypt. They work with hundreds of families monthly and identify children who could benefit from the opportunity offered by Gaza Children’s Cinema. A “cinema gathering” is organized several times a month at locations chosen by our partners. For example, in one of our first showings, we featured an animated film produced in Gaza called “The Bridge,” which tells the story of four animals trying to cross a river who in their bickering stop any of them from succeeding. The older youth, trained by our partner organizations, lead the post-film discussion, encouraging the children to rethink their behavior, reactions and attitudes when faced with various types of conflicts. No “right” and “wrong” answers are imposed; rather, the facilitators are trained to guide children by posing critical questions and demonstrating another way of relating to others. We have reached out to few hundreds of children residing in margined communities in north and south of the Gaza Strip. Children joined the cinema sessions with their parents in inclusive and entertaining settings. With the support of Gaza Children Cinema volunteer team, children have the opportunity to engage into stimulating and interactive discussion prior and after the film screenings. The cinema sessions provides children with an open platform for reflection and build self-steam. In 2017, we hope to engage 2,000 children in our cinema events in their marginalized areas. Each targeted child will be supplied by an art bag to encourage reflect, imagine and enjoy painting. 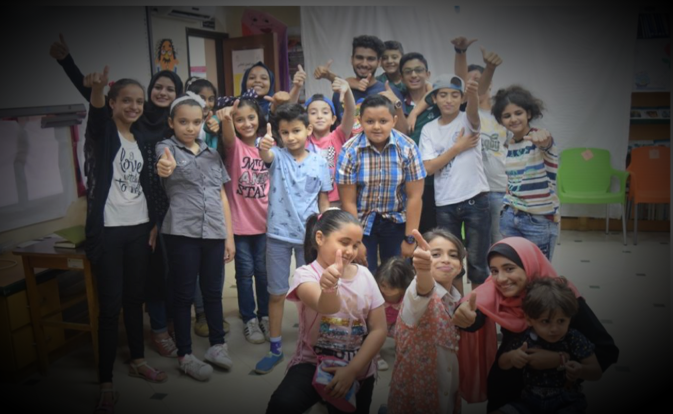 The team requires technical and financial support to make cinema sessions accessible to more number of children cross the Gaza Strip; at the same time, it helps the team maintaining the work with the existing groups of children benefiting from the program. 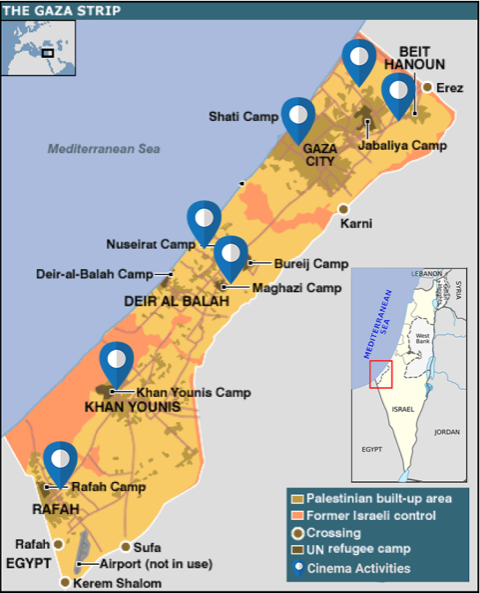 We know most of you cannot come to Gaza, and that your resources are limited. But if you give what you can, no matter how small, to this project, we will amplify your gift so you will be with us in spirit, touching the lives of thousands of children. But there is still hope. Dr. Tahrawi explained that art could be used as a bridge to a better future and that despite the gruesome content of many of the children's pictures the drawings could help the children overcome their grief and move on. "The children can relieve their stress by expressing their feelings instead of repressing them. I was surprised at the bright and cheerful colors used by certain children. I expected them all to use bleak colors such as black and brown. But the rainbow of colors is proof of their resilience," according to Dr. Tahrawi. "If they are given the chance and the same opportunities as other children they can overcome Gaza's tragic history and circumstances. Unfortunately we don't have sufficient people qualified in art therapy in Gaza," added Tahrawi. Gaza children need imitate and continued interventions in order to grow and flourish despite the recurrent conflict. Ahmed Ashour, the team leader of Gaza Children Cinema in Gaza, indicated that the impact of cinema sessions on children in “behind description” and that children are always waiting for more screenings. Through Gaza Children Cinema sessions, children are encouraged to draw their feelings and tell stories in images. Children are also encouraged to play out their experiences in supervised play sessions. These approaches enable the children to find ways to externalise the trauma, rather than letting it fester like an internal time bomb. Please help us through sharing this update with your networks. VIDEO: Israel ongoing siege on the Gaza Strip for more than 10 years. Within these years Palestinian tackle with a dangerous Humanitarian Crisis composed by Shortages of human resources in the Water, Sanitation, and power. We have good news to share with you. 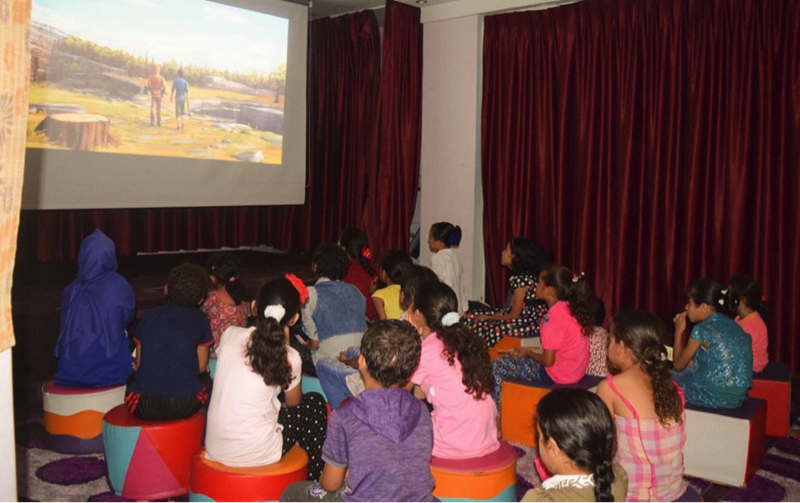 The Gaza Children’s Cinema team has completed the first phase of the cinema activities across the Gaza Strip, Palestine, and with your help, we have given hundreds of children in Gaza their first experience of cinema. 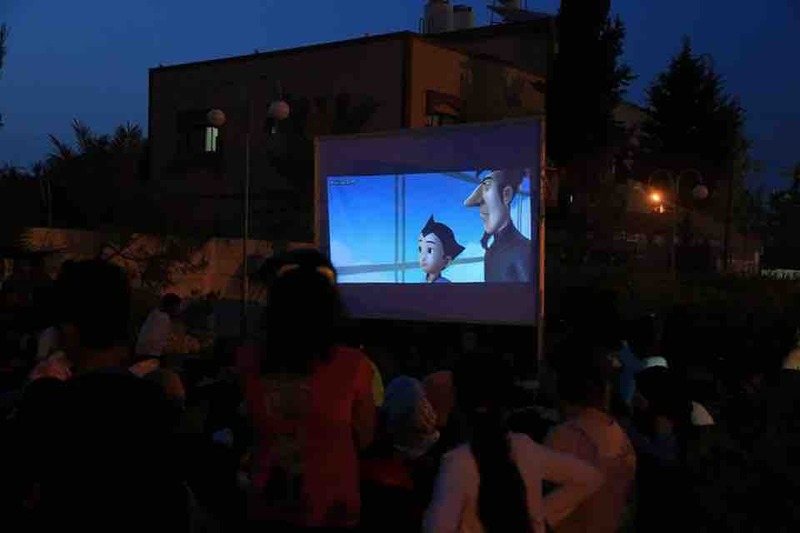 In 2017 Gaza Children’s Cinema held about 100 film screenings, offering spaces of light relief, entertainment, dialogue and peace, all valuable commodities in the besieged Gaza Strip. We literally could not have gotten this project off the ground without the generous support of each and every one of you, so on behalf of the Gaza Children’s Cinema team, THANK YOU! We are now excited to launch the second phase of this project, and we have big ambitions! Due to the success of the Gaza Children’s Cinema project in 2017, we have growing interest from people across the Gaza Strip wanting to get involved and have screenings in their areas. Despite the harsh realities in Gaza, the Gaza Children’s Cinema team is determined to continue reaching out to more children in order to provide an environment where kids can be kids. We have a good news to share with you. 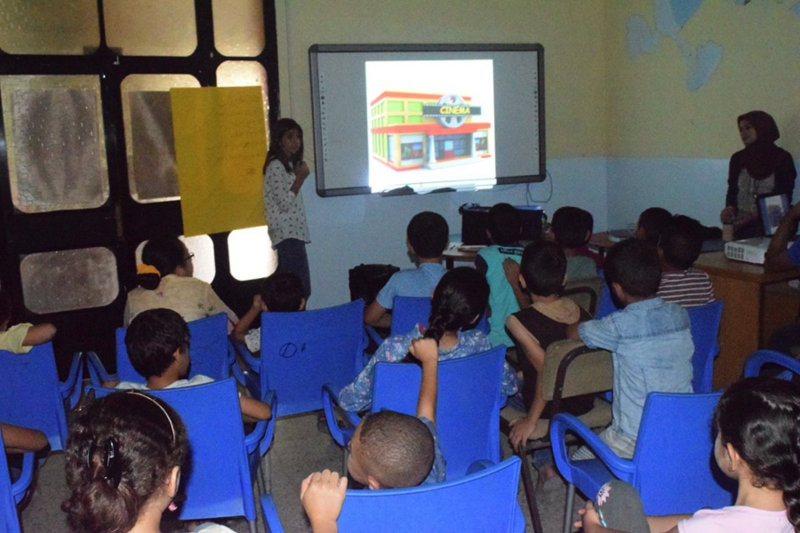 The Gaza Children Cinema team has completed the first phase of the cinema activities across the Gaza Strip, Palestine. 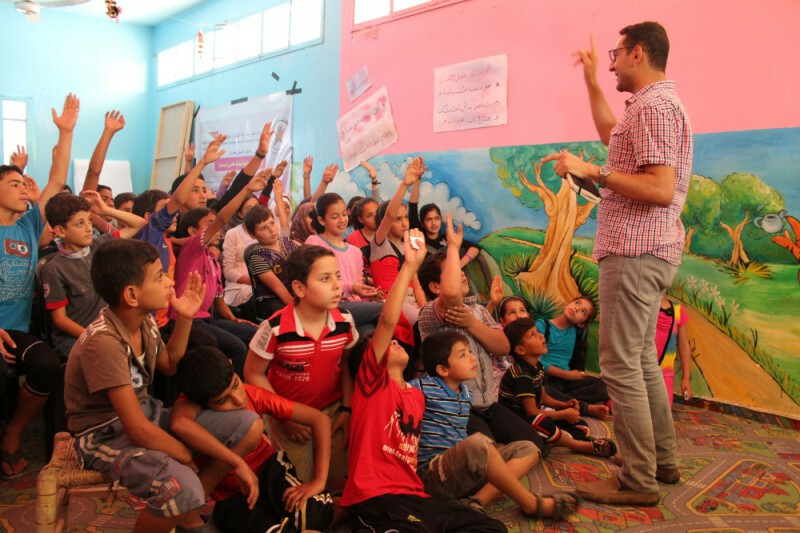 Despite the harsh realities in Gaza, the Gaza Children Cinema tea is determined to continue reaching out to kids in order to provide an environment where kids can be kids. Therefore, we wish to share with you the amazing outcome of the idea from Gaza. And today we are hoping to raise funds to sustain this project for another year. “What would a cinema theatre look like? I wish for all the children freedom, justice and peace and may all their dreams come true. A very worthwhile project. These children need the strength and joy this community project can bring. Great work Ayman to bring some happiness into these children's lives.